"but still the ridiculous myth temps speculators to search for a thing which never existed". Terry, Michael. Sand and Sun. 168. For something that never existed it's amazing the volume of written material published on Lasseter's Reef. Most of it purely speculative as there is no reef to assay and no genuine map shows it's location. But this persistent myth did have sound beginnings....for a myth, in National Archives file 1930/512, usually referred to as the Gepp Report. This file is surely worth more than it's weight in Lasseter's gold. 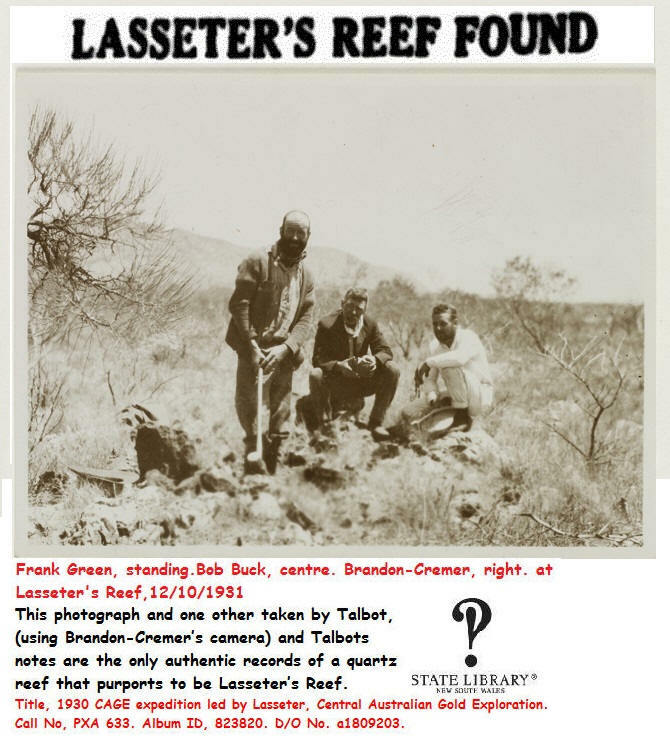 It has the letter that started the legend, as well as correspondence and associated documents where Lasseter commits himself in writing to a few vague details regarding his reef. Lasseter consistently claimed the reef assayed at about three ounces to the ton, perhaps a little over, in a letter to Calanchini at the Western Australian Mines Department, he reminded Calanchini that the original assay reports submitted by himself and Harding should be on the Mines Department files. of course the assay reports cannot be located and I've often wondered if Calanchini wasted his time looking, I suspect not. It is worth noting here that Lasseter and Harding apparently had assays carried out far and wide. There are reports of assays from Burtville, Leonora, Laverton, Kalgoorlie and Hall's Creek as well as Perth and Sydney. Others have claimed extraordinary values for the reef, seven to ten ounces to the ton being common, and if Lasseter's Reef is Earle's Cave of Gold then as high as 60 to 80 ounces to the ton, now that would clog the dolly pot! But Lasseter settled for a comparatively modest three ounces to the ton and stuck with that aspect of his story. As written by Lasseter, the dimensions of his reef are vast, his letter to Texas Green claimed that assays had been taken over 14 miles of reef, although in a later letter to Calanchini he was a little more restrained and wrote, "the reef can be traced for over ten miles". Lasseter never gave any other dimensions to the reef, Coote supplies that information in 'Hell's Airport', from the first meeting with Lasseter in John Bailey's office, "from four to twelve feet wide, and at places was four feet above the surface. It is deep in the heart of the mulga". John Jenkins, the Mining Secretary to the A. W. U. also present at that first meeting, calculated that ten miles of reef, four to twelve feet wide, outcropping four feet and say a hundred feet deep, at three ounces to the ton should produce £200,000,000 worth of gold!! Lasseter had spun a good yarn, "The spell of gold was on us". But Lasseter never disclosed in writing the exact location of these hundreds of millions in gold, to him for the obvious reason that others would diddle him out of his gold. In response to Fred Blakeley's direct questions on the location of the reef, Lasseter replied, "if I told you that, you'd know as much as I do, and you wouldn't want me", a fair reflection on Lasseter's attitude towards his fellows. In his letters to Green and Calanchini Lasseter gave the broadest location of the reef, somewhere in Central Australia and nothing more specific, until Calanchini asked some pointed questions in a letter to Lasseter dated the 30th October 1929. (The letter that was, "just to hand, having lain in a disused mail box for 3 months") The opening lines to Lasseter's reply, dated the 14th of Feb. 1930, are revealing, "The reef to which I refer has never been surveyed & therefore I am unable to give you it's exact locality, but to the best of my knowledge & belief the Warburton Ranges is the nearest to it's location". Lasseter should have remembered what he told Gepp and Ward at their interview on the 14th of November 1929, on that occasion placing the reef, "250 miles west south west from Alice Springs, and near the western end of the Macdonnell Ranges", areas that are at least 200 miles east of the Warburton Ranges. Perhaps it never occurred to Lasseter that fellows like Ward, Gepp, Calanchini and Gibson are in frequent contact with each other on a professional basis, and they had soon noticed the variance and vagueness in Lasseter's story. Within the month they had dismissed Lasseter's yarn as nonsense, but Gepp, and the Government he reported too, saw other possibilities in Lasseter's tall story. That Lasseter had no reef to give a location has been wilfully manipulated and blissfully ignored since, and it's created a nice pile of literature on where that reef might be, with a few hopefuls, who have never been to the area, writing seemingly convincing books and articles on the reefs precise location. The best that can be gleaned from Lasseter's hand is that the reef is 10 to 14 miles long and assays at about three ounces to the ton and is located somewhere between the Warburton Ranges and an area 250 miles S. S. W. of Alice Springs. Hence the expanse of Lasseter Country. A possible headline for October 1931, that would have been true enough if printed, but Lasseter's Reef was 'rediscovered' on 11th October 1931 by Frank Green, the prospector on the Second C.A.G.E. Expedition, fortunately for history and investors H. W. B. Talbot, the geologist on the expedition, took photographs and kept detailed notes on this potentially fraudulent discovery. The following year the Baileys, perpetrators of the Lasseter Reef fraud, claimed that specimens from this reef assayed at 16 grains (~1 gram) of gold to the ton, thus proving the country to be auriferous and therefore worthy of a Third Expedition. The Second C.A.G.E. Expedition arrived at Piltardi rockholes late afternoon 7th October 1931 where a substantial camp was established while Bob Buck and Johnson Breaden forayed further west for waterholes and Aboriginals. Talbot and his colleague, Torrington Blatchford, the West Australian Government geologist, thoroughly checked the land in the approved manner, that is, on foot, and discovered numerous quartz reefs, "but not of the type likely to carry gold or other minerals". Buck and Johnson returned three days later, reporting some success and vague plans to move the Expedition west early the following week, meanwhile Talbot and Blatchford continued their investigations. on Sunday the 11th they trekked to Mount Phillips, "the walking was terribly rough" and returned early that afternoon to be informed by Buck that he and Green had found a reef that Lasseter had pegged, "Green was most impressed with the reef", and he intended to sample it the following day. Talbot, a remarkably quick witted man, and already deeply suspicious of the motives behind the Expedition kept his thoughts to himself, "beyond saying that we have been here four days and only heard of the reef last night", during a camp fire yarn, and the reefs fortuitous discovery the following morning was indeed suspicious, considering that Frank Green the discoverer had done nothing except the cooking since the Expeditions arrival at Piltardi. Monday morning, "After breakfast Blatchford and I went to the leases pegged by Lassetter and went over the ground carefully", Talbot noted that four leases had been pegged and the datum posts had been marked M R, that is Mick Roach, who coincidentally, had arrived at the Expeditions camp the previous Friday. Talbot concluded that even if gold were proven on assay the ground was worthless because of the small size of the reefs. Tuesday found the geologists prospecting to the south west and returning via Lasseter's leases where they expected to find Green at work sampling the reef, he was idle having left his tools back at camp, Talbot noted that since its discovery four days earlier Green had done less than six hours work on Lasseter's impressive reef. The following afternoon, "Green dollied some of the stone he had collected from Lassetters leases, but he did not raise a colour of gold". The Expedition finally moved west on Thursday the 15th, when passing through Lasseter's leases Talbot noted that, "At 220 chains on a bearing of 300° from Pilltardi we passed Lassetters pot hole". Aboriginals met on the journey indicated a few more locations where Lasseter had fiddled about with pegs and potholes, all quite worthless. The above photo and one other taken by Talbot of the same reef, are the only known photographs of Lasseter's Reef and Talbots detailed notes give the exact location. Although Lasseter's Reef has been rediscovered several times since October 1931, and in various places, these later finds have never been photographed and the discoverer has never been able to relocate the reef.